I recently reviewed this cute froggy headband to review from CozyPhones. Of course I do not have any kids but I gave it to the neighbour's kid. CozyPhones is a family business based in the U.S.A and they make headband headphones for children and adult. They have a bunch of cute CozyPhones for kids, sleep headphones for adults and lycra mesh ones for those who are active. 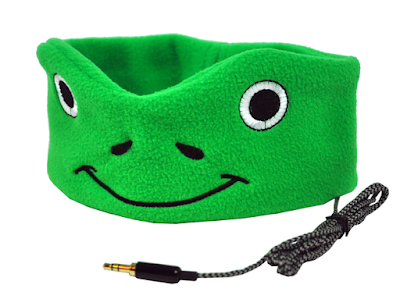 I asked Micheal (neighbour's child) what he thought about the froggy CozyPhones headband and he said he loves it. He likes that it is a frog and he said that it works great. He is 6 and his mom tells me he uses it constantly when he watches videos on his tablet or playing games. The headphones go on your ears. I just put one side on my ear just to see how the quality is and I am very impressed. Also, you can remove the headphones from the band so you can wash the band if needed. Do I recommend? From the sound quality and the quality of the band, I do recommend. Also, I think I will be buying myself a sleep CozyPhones in the near future because I have a difficult time sleeping and I like listening to audiobooks or music in bed to help me fall asleep. regular headphones and earbuds just don't work so well and they can be painful.